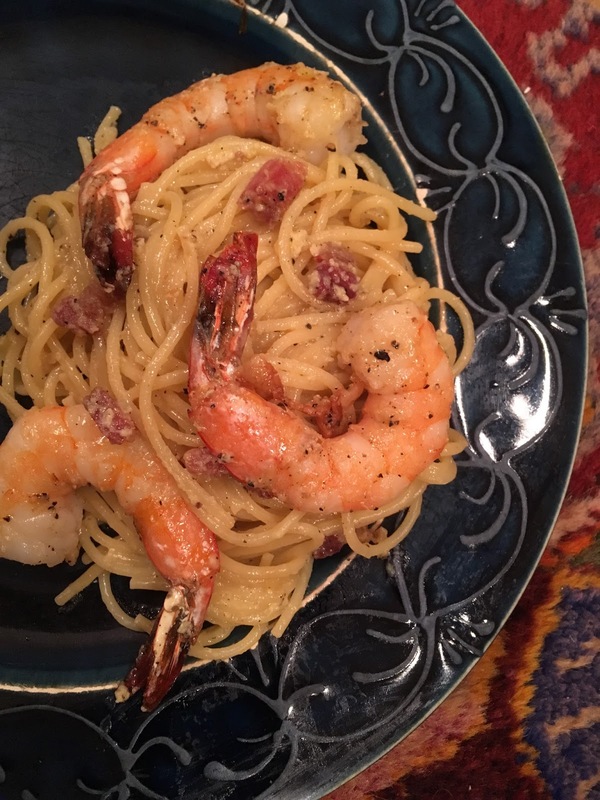 Spaghetti with bacon, shrimp, and cheese, what could be bad? While you’re boiling a pound of spaghetti in a large pot of salted water peel and devein 18-20 medium shrimp. Salt and pepper the shrimp and cook in a large straight sided skillet with a couple splashes of olive oil over high heat until nearly cooked through, then set aside. In the same skillet, cut two quarter inch slices of pancetta into small chunks and cook until lightly browned, turn off the heat and leave the pan on the stove. Then, in a large bowl, lightly scramble together two eggs, a cup each of parmesan and pecorino cheese, and a generous grind of black pepper. Drain your spaghetti making sure to reserve about a cup of the pasta water. Turn the heat up on the pancetta and stir the in the spaghetti followed immediately by the egg and cheese mixture. Quickly toss together while slowly pouring in enough pasta water to create a creamy sauce. When the pasta is completely coated, add the cooked shrimp, salt and black pepper to taste, and toss once more before serving.